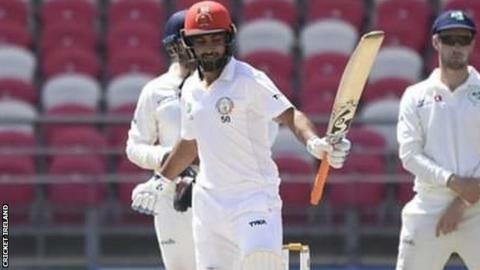 Afghanistan earned their first Test win after Rahmat Shah's 76 and Ihsanullah Janat's 65 helped them earn a seven-wicket victory over Ireland. Starting day four on 29-1 chasing 147 for victory, the duo's 139-run partnership ended any hopes of an unlikely Ireland fightback in Dehradun. After hitting 98 in Afghanistan's first innings, Shah was out for 76 just three short of the victory target. Afghanistan responded with a total of 314 to secure a 144-run first-innings lead and despite Ireland's improved second-innings total of 288, helped by Andrew Balbirnie's 82, the Afghans were still in a strong position going into the penultimate day. Ireland captain and opener William Porterfield, who managed only nine runs in the contest, admitted that the Afghans "outplayed us". "We had to capitalise in the first innings. If we'd done how we'd done in the second innings, it could have been a completely different game. But credit to Afghanistan." The Irish side's home debut ended in a five-wicket defeat by Pakistan in a hard-fought contest last May, while Afghanistan succumbed inside two days against top-ranked India a month later in Bengaluru. Prior to the Test, Afghanistan won a Twenty20 series 3-0 at their adopted home in Dehradun before Ireland rebounded to earn a 2-2 draw in a one-day series.